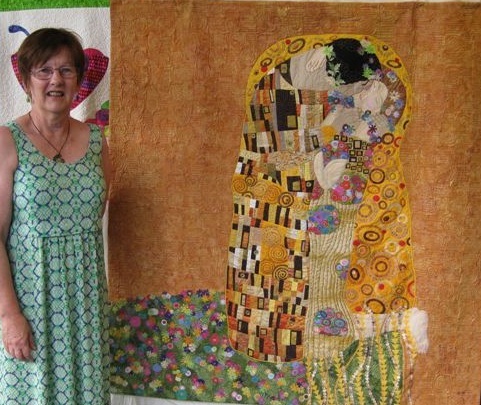 Annie with her Klimt Kiss quilt. I first met Annie White at a workshop in Auckland. It was run by Hollis Chatelain and Annie, her sister Mary, and I were attending to learn how to paint on fabric with thickened dyes. I've met Annie again several times and watched her quilting star rise, so it was lovely to have a good chat with her about her unusual quilts, her creative practice and how she fits quilting into a busy life as a teacher librarian. Annie professes to getting bored easily and wanting to try many different techniques. Her white textured quilts (above is 'Korowai Ma' and you can read more about the making of it here) show a willingness to take risks and experiment with shape and form till she gets it right. 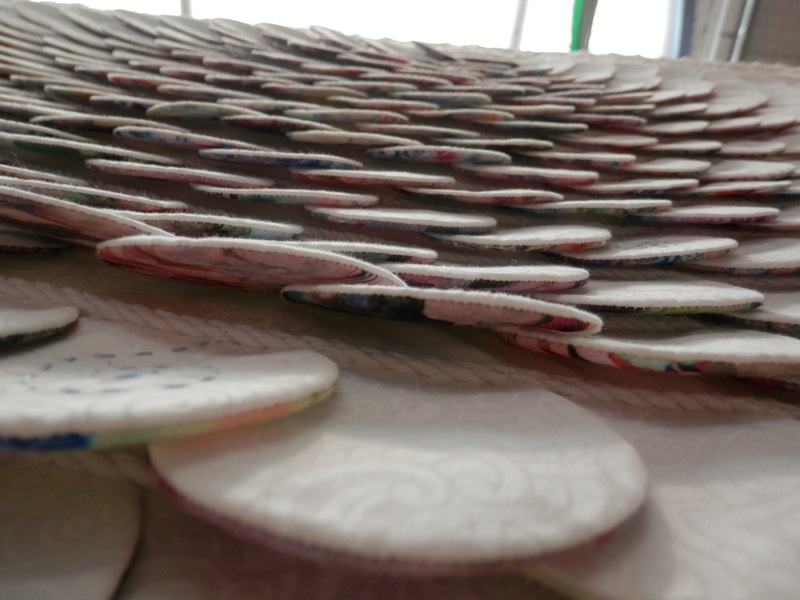 This photo shows the underside of the petals of 'Korowai Ma'. You can see the multicoloured fabric and the cording that we talk about in the podcast. 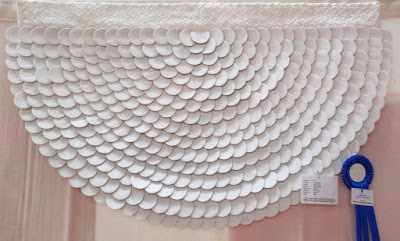 You can see Annie's first white quilt called 'White on White' here, as a prizewinner at the Auckland Festival of Quilts 2013. Annie also had a work selected for the previous exhibition curated by Brenda, called 'Living Colour'. This work was titled 'Unfurling'. 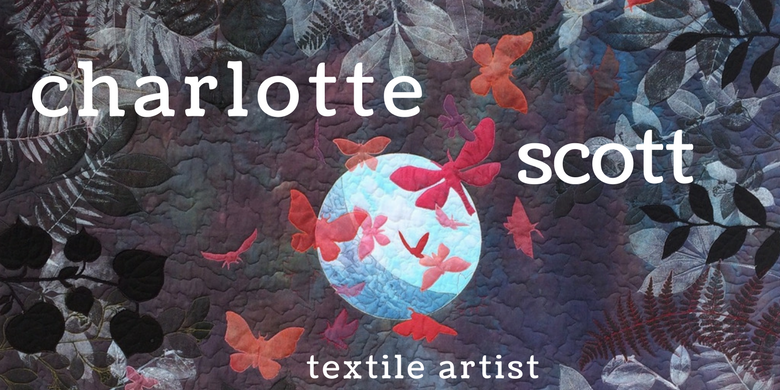 Annie has also had work in the Dorothy Collard Challenge run by The Auckland Quilt Guild, and you can see her prize winning quilts here and here. It was a pleasure to talk to Annie about her life here in New Zealand, her connections to Australia and how she translates her stories into fabric and thread. I hope you enjoy listening. It's Spring time here and I feel like coming out of hibernation. 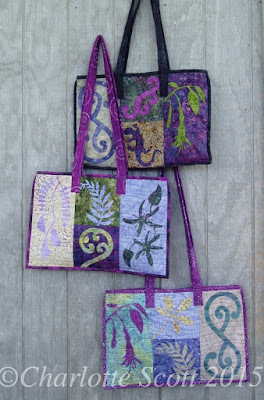 So to ramp things up a bit, I've decided to run a bag making class at Opua Arts Studio and Gallery. My Aotearoa Tote is fairly straightforward if you have a bit of appliqué and quilting experience, but you'll learn a great positive/negative appliqué method and lots of tips on binding and quilting to make the whole thing come together smoothly. 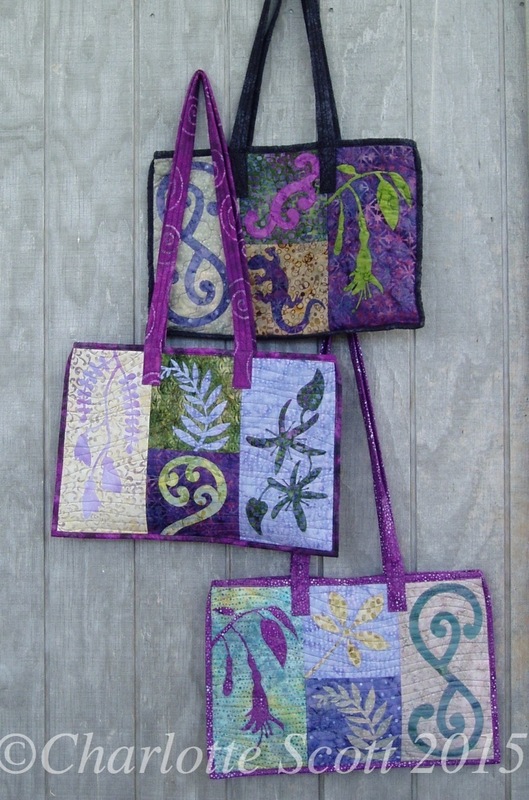 Want to learn how to make your own Aotearoa Tote? 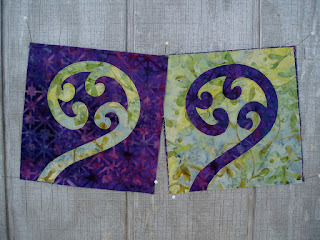 I am running a class at Opua Arts so you can learn how. October 12th and 19th (Wednesday mornings), 9am till 12.30pm. Your own sewing machine and some basic sewing, quilting and appliqué skills required. $60 pp. This is a project-based class where you will learn the ins and outs of positive/negative appliqué and come away with a funky New Zealand styled tote bag to show off! 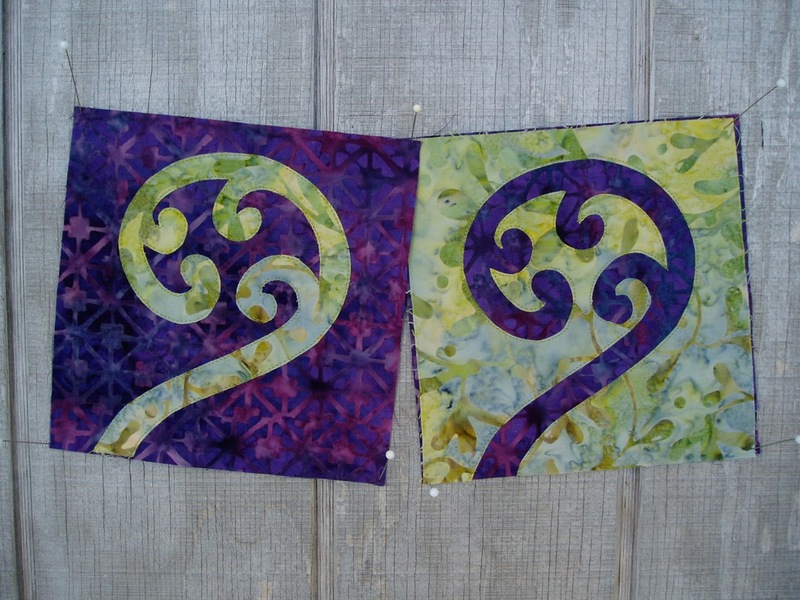 This class includes machine quilting and binding, so plenty of tips and tricks are included to help you get great results with these skills. Different applique designs will be available for the bag sides so you can customise your layout, and a full written pattern is included in the cost. Students will need to provide their own fabrics and materials. A needs list will be provided on receipt of a deposit of $20. What I like about this bag is how customisable it is. Students get to pick their own mix and match of patterns. And they can make them simple or trickier depending on how long they want to spend appliqueing. 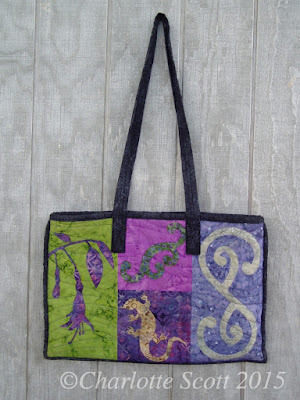 So, get in touch if you want to make your own eye-catching version of this bag. I'm looking forward to seeing some different colour ways and pattern choices! 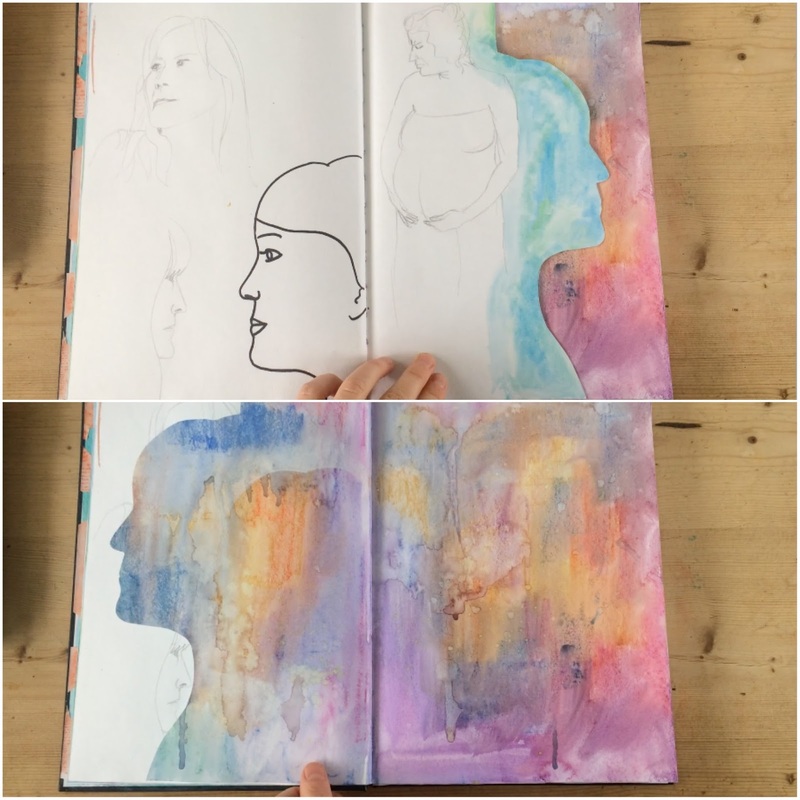 I wrote recently about starting a 100 Days Project. Luckily there was a group and a website and someone had done all the thinking and all I had to do was sign up and join in. We are now onto our tenth day, which means we are a 10% through the process. Put another way, I've got 90% more to do! So how am I feeling about it? I wrote a little summary of how I've been feeling day to day. I'm wondering how I'll feel at day 50. Day One - nervous and excited, so much to live up to! Day Two - well that was easy, too easy perhaps? Day Three - this isn't so bad, but am I getting anywhere? Day Four - Ick, what a stuff up, now I'm nervous again. Day Five - I think I'm onto something. Day Six - I really like this. Day Seven - I really LOVE this. Day Eight - I've got so many ideas, I'm bubbling over! Day Nine - how do I work on all these ideas?! The photo above was day five. 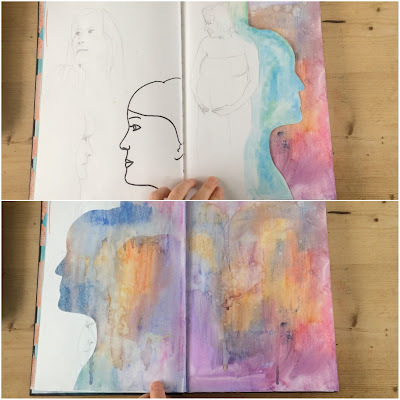 That was a spread in my sketchbook with a silhouette cut from the edge of one page so it appeared on two page spreads. It's the day that I felt I had a little breakthrough. And today is Day Ten. Today I'm wondering how I can spread out my ideas a little. Can I work on the same face or quilt two days in a row? Will I be cheating if I do that? I've got so many ideas but some I want to work on more deeply than others. Above is the spread of all my days so far. Day four was a scary one, I felt like hiding it, but that wouldn't contribute to my process, so there it is in all its glory!